Klayman: Napolitano Does Not Know What He Is Talking About as Usual! He Has Become Very Anti- Trump and Conservative! On "Fox & Friends" Tuesday morning, Judge Andrew Napolitano reacted to Rep. Devin Nunes suing Twitter for allegedly "shadow-banning conservatives," saying that even if that censorship took place, "it's not illegal." 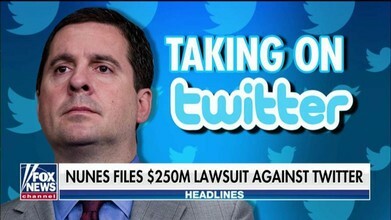 Nunes (R-Calif.) filed a major lawsuit seeking $250 million in compensatory damages and $350,000 in punitive damages against Twitter and a handful of its users on Monday, accusing the social media site of systematically censoring conservative viewpoints, and totally "ignoring" lawful complaints of repeated abusive behavior.